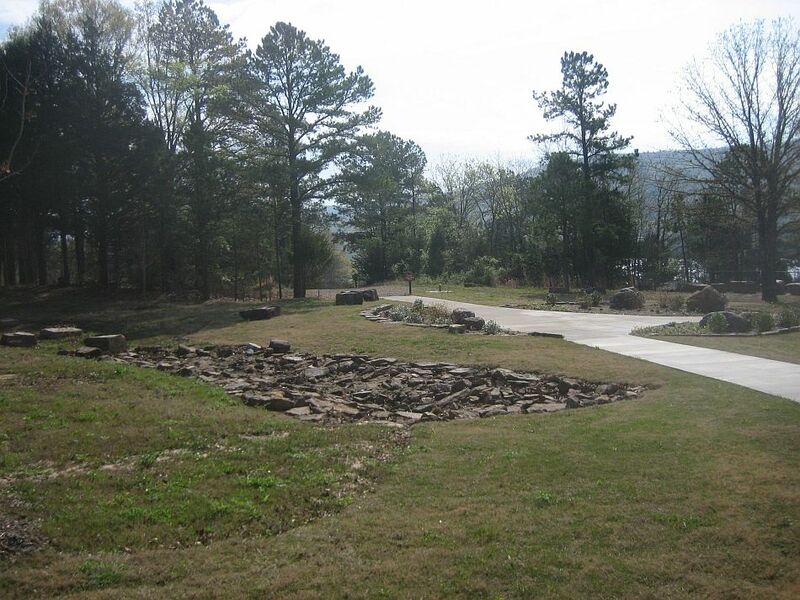 Lake Fort Smith State Park to Dockery Gap (OHT Map 1): With the construction of the new Lake Fort Smith section, the OHT begins at the new Fort Smith State Park visitor center (OHT-01, N35.695498 W094.118501). 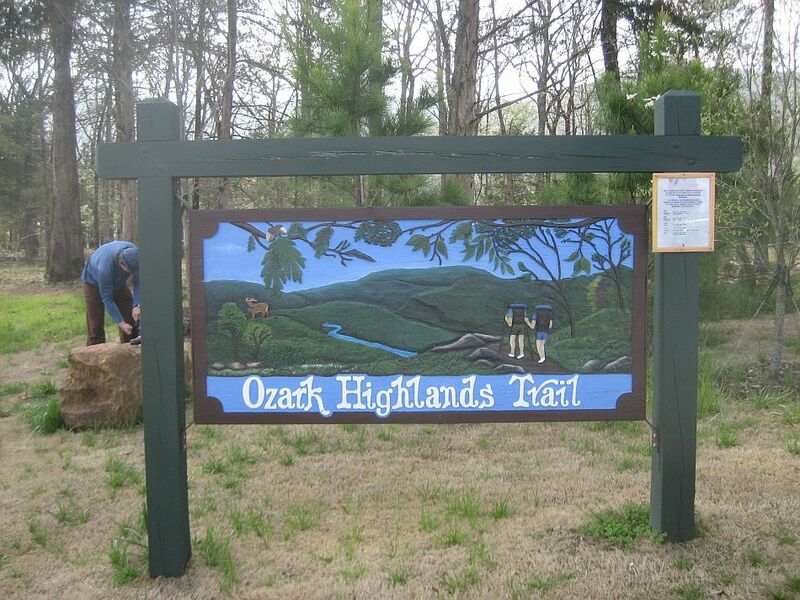 When you pull into the parking lot you will see a big colorful Ozark Highlands Trail sign to the left of the building. Follow the sidewalk behind the visitor center to the gravel road near the lake and you will see another OHT sign, albeit a more standard brown one. From here on follow the white blazes of the OHT all the way to the Buffalo River at Woolum. 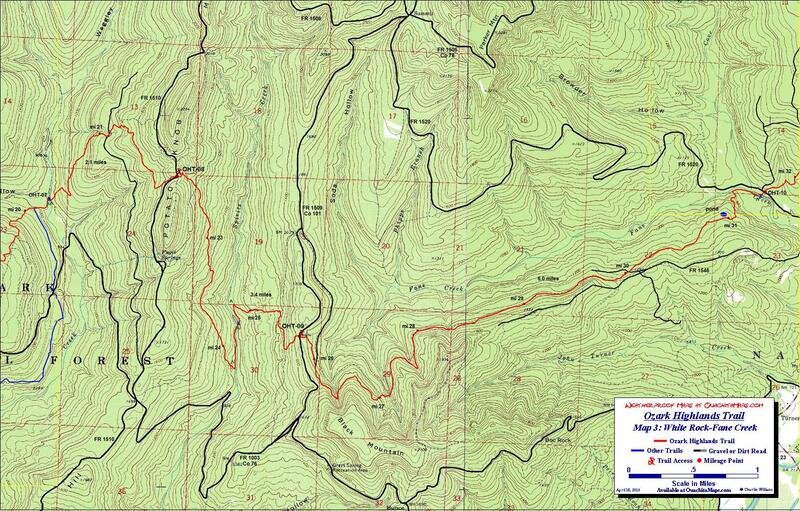 You will note on these maps the location of the mile marker you will pass on the trail. As you can well imagine, it is difficult to cut a new trail that is exactly the same length as the one it replaces (i.e. 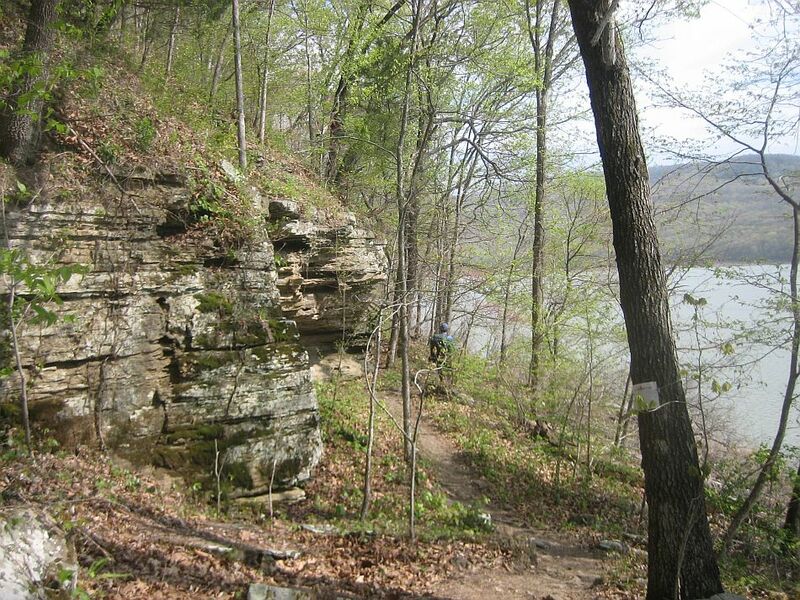 the original 165 miles of trail began at the old state park which was 3 miles south of the new visitor center). In addition, if you have hiked much, you know that the mileage can vary from map-to-map, guide book-to-guide book and even trail sign-to-trail sign. Even with the advent of the GPS, no one really knows the “exact” distance of these trails. Trail wheels, the most tried and true method, skip when they roll and can measure bumps and swerves that your stride will ignore and have human error. While a GPS may collect three dimensional data, converting it to a two dimensional map means that the length is always shortened (remember the Pythagorean theorem from geometry?). Plus the commercial grade GPS systems can have quite a bit of error if the radio signal is blocked by your body, tree cover, terrain, etc. Then there is the question of what you are measuring? Take the California coast line and measure it on a large scale (detailed) map. Did you get all the zig and zags? Feel like you did a great job? Now walk the beach with a wheel carefully following the contact of the water with the shore. Besides the fact that it is moving all the time due to waves and tides, there are even more jigs and jags that don’t even appear on the best map. So, what’s the point of all this? The mileage from the GPS does not conform with the mileage markers. My GPS indicates that mile marker 7.0 in Jacks Creek is only 5.8 miles from the Visitor Center. Furthermore, the increments between each mile marker can be off as many as two 10th of a mile (20% error!). I have chosen to handle this the following way. 1) I think the new section is a mile short of the 7 miles indicated. If you look at the mileage chart (pdf file on the OHT web page, I have put a 1 mile fudge in it to keep the rest consistent with the trail markers, Tim Ernst’s trail guides and the Forest Service. 2) except for the section up to Jacks Creek, the mileage I will use in the trail description will follow the mile markers, etc. 3) If you see that the mileage does not correspond with any Backpacker Magazine piece (including the Trimble site) that use my track and way points, it is because they used the GPS data. The new section is a rugged but fairly level trail that begins in the woods but is soon wedged between a small bluff and the lake shore. There are lots of small ups and down in the gullies and many rocky areas. 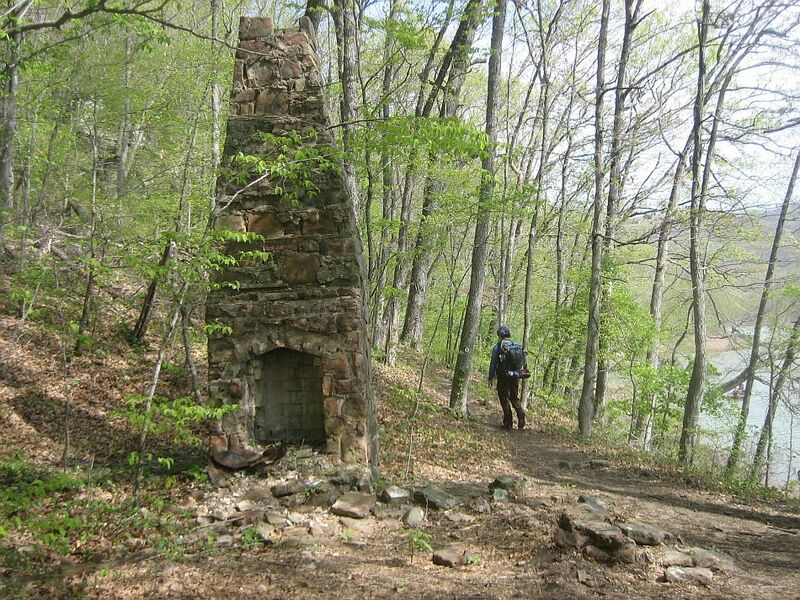 Of historical note, you will pass an old chimney at 1.6 miles, another one at about 1.8 miles and a cistern in the bluff face in between them. A little way after the second chimney the trail follows an old road bed for a while before it darts into the woods. We were very pleased with this new section. Though there are a few rough places that are going to be slick when wet it was rather scenic. 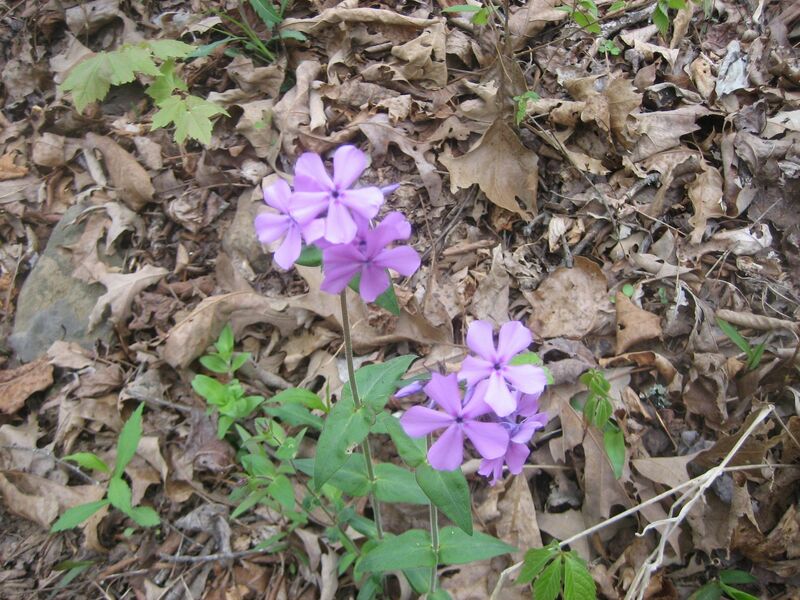 Combine that with the spring wild flowers such as the dwarf crested iris, downy phlox and blue star and it was a very pleasant walk. At 2.7 miles, the trail brushes past Forest Road 1558. There is a small pull-off for parking so this can be used as a trailhead or place to scout the Frog Bayou crossing (OHT-02, 2.9 miles, N35.715214 W094.112928). As best as I can tell, Frog Bayou is always a wet crossing and after a decent rain, often impassable. When we were there in April 2009, we were told about a couple that hiked from White Rock the week before only to have to go back because of high water. That’s a long back-track! While we crossed without a problem, it was 150 feet across and reached thigh-high. We crossed with another hiker that had to cross back 2 days later and since it rained in the intervening days, spent hours working his way upstream to find a safe place to get across. Needless to say, the Frog Bayou crossing needs to be taken into consideration when you plan your hike. On the other side you will be on level trail that meanders through the woods in an apparent effort to rack up some of the missing miles from the previous trail section. It looks like there is plenty of potential for lakeside camping. At about 4.8 miles you see a lowland areas where Jack Creek meets Lake Fort Smith. The trail bears east as it enters Jack Creek valley and crosses a drainage spilling from Patrick Mountain at 5.1 miles (OHT-03, N35.705680 W094.087659). At 5.8 miles. We hit the official 7 mile marker for the OHT. From now on, the narrative will be based on the ground markers. Jack Creek is another pretty valley. I am sure part of it is the season. In April, the first leaves are coming out of their buds providing a delicate green background. 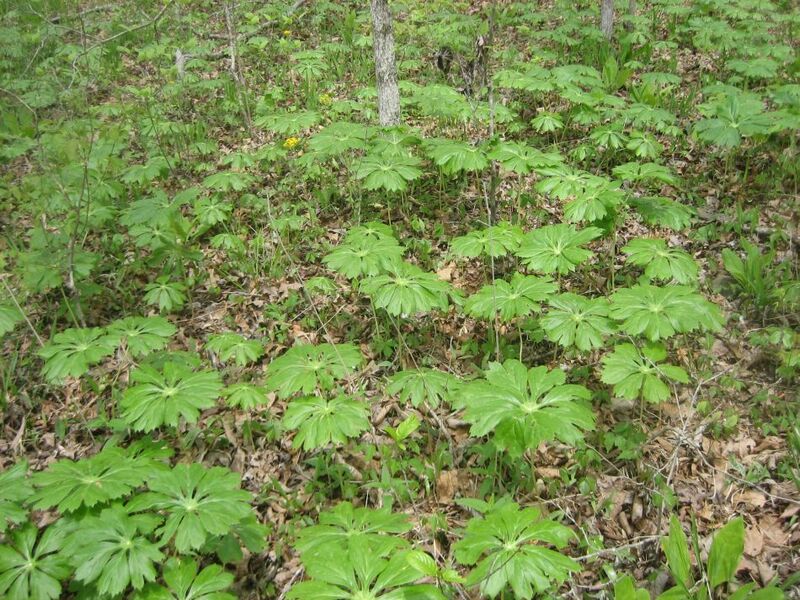 The forest is still open and the underbrush has not made it seem claustrophobic. 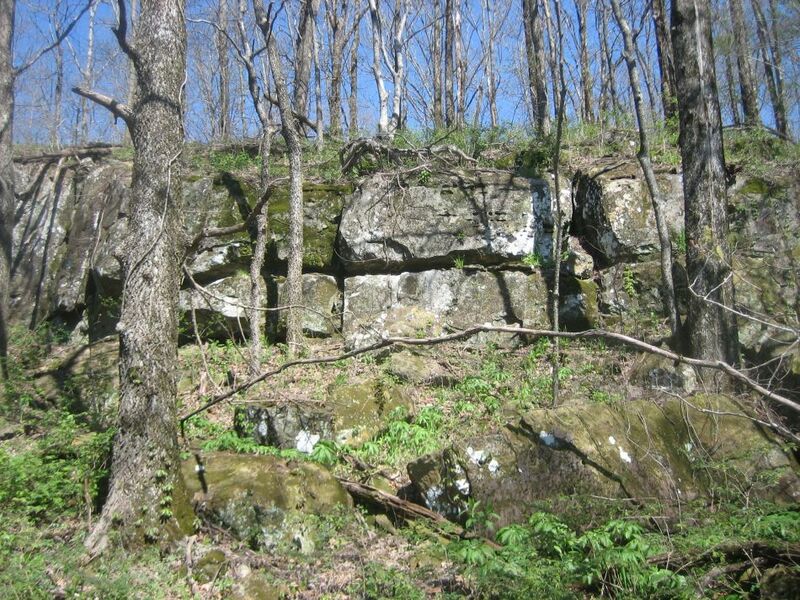 Moss covered outcrops are visible from the trail. 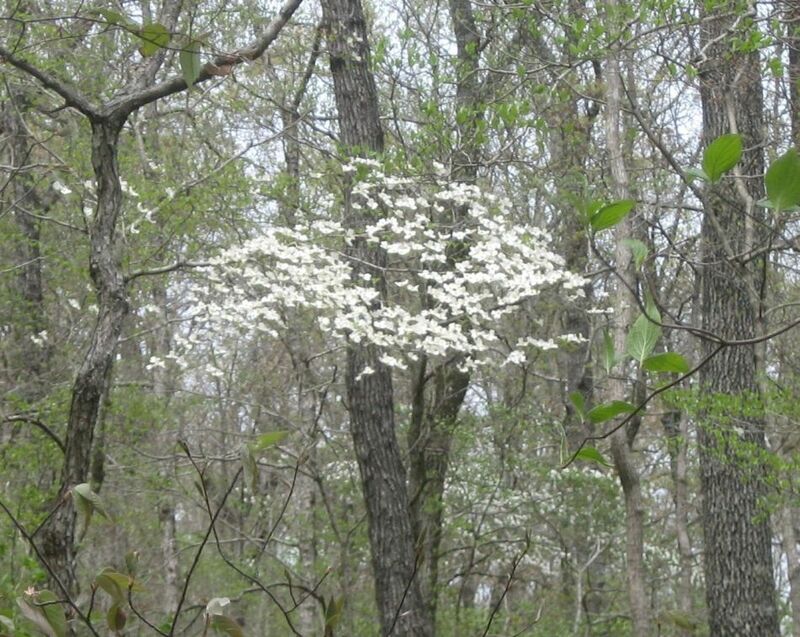 The spring flowers such as the plain leaf sunflower plentiful, the dogwoods are in bloom, the may apples (video) provide a low canopy over the forest floor, the creeks are full of water, the temperatures usually perfect and the mosquitoes as rare as a bear siting. 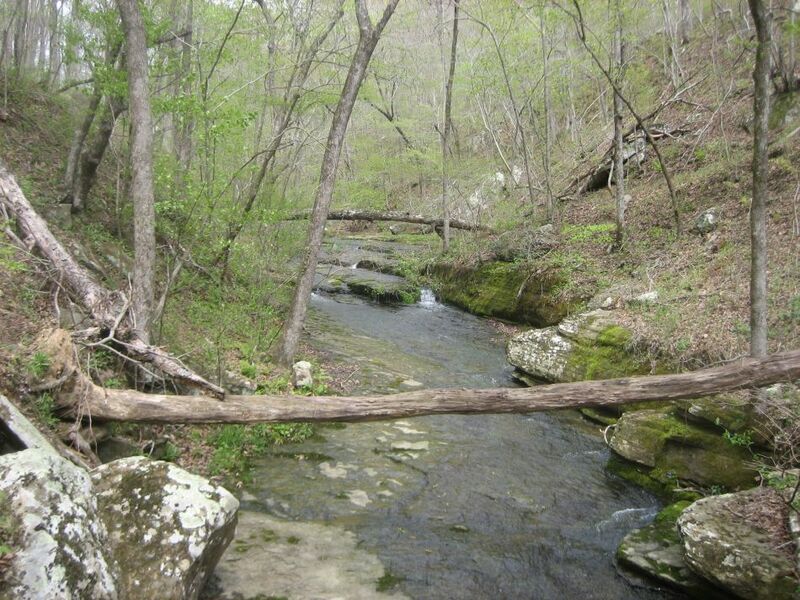 The trail crosses Jack Creek at 9.4 miles. Less than a 10th of a mile later, just as the trails begins its climb to Dockery Gap, there is a small camps site on the right. The climb to the gap is about 400 feet, mostly right after you leave the valley floor. 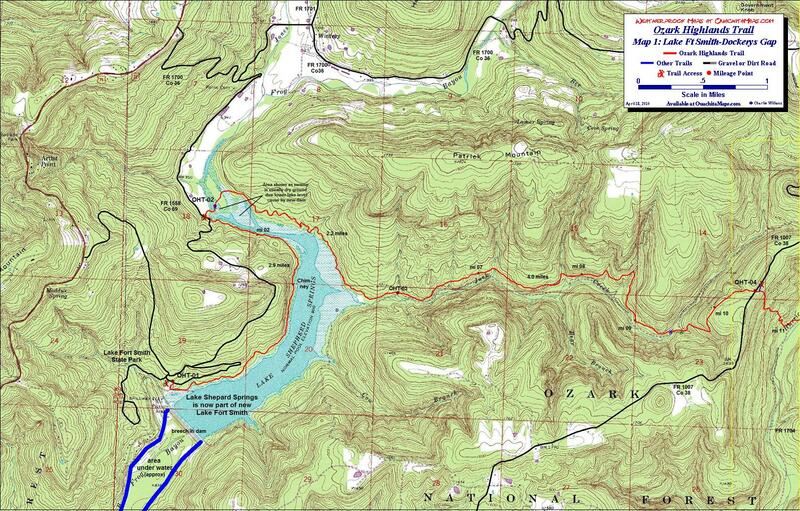 Dockery Gap to White Rock (OHT Map 2) : Around mile 10, the trail levels off and crosses Forest Road 1007 at 10.4 miles (OHT-04, N35.706350 W094.038445). There is a parking lot just to the north that can be reached either by road or a spur trail on the east side of the road. It is a only 0.7 miles to the Hurricane Creek (video), the first 0.6 descending about 550 feet. 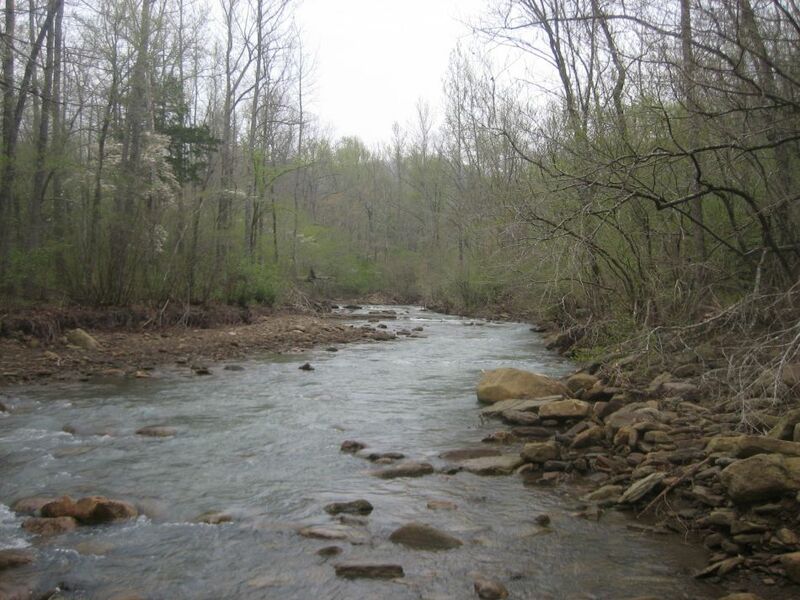 (There is another Hurricane Creek on the OHT that cuts through the Hurricane Creek Wilderness. These are not related or connected). If the water is too high, take the forest road (west side of the creek) north to FR 1003 and cross there. If trail blazing is not on you list of fun in the woods, stay on FR 1003 for a few miles until the pipeline crossing OHT (mile 12.7). Since our strategy for the trip was to get across any large creek as soon as we got there in case it rained, we were more focused on crossing the creek when we got there and I don’t remember if there was a campsite on the west bank. If anyone sees one, let me know and send a picture. There is a small campsite (video) on the east bank and after about an hour of cleaning up the Arkansas fire pit, we turned the site into a nice bivouac for the evening. 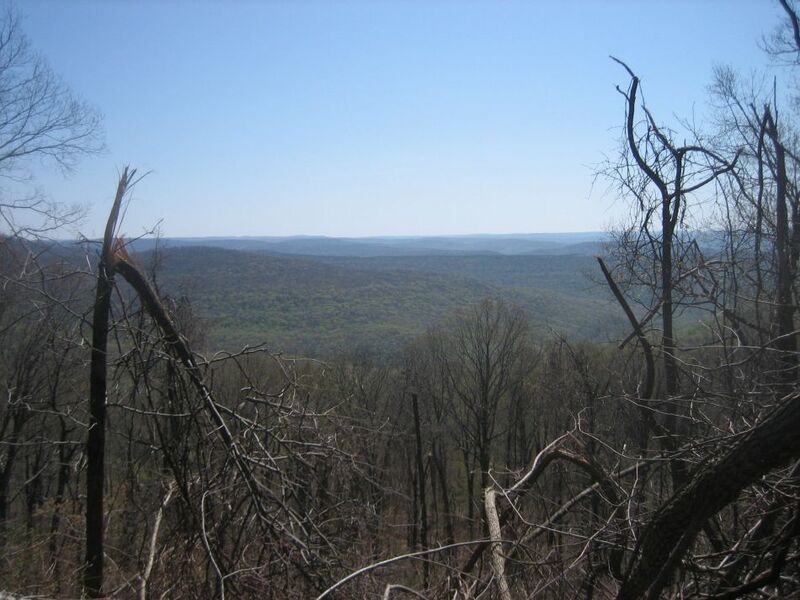 The next 2 miles of trail is a gradual 850 foot uphill towards the top of Richardson Mountain. There are some nice small sandstone bluffs and rocky outcrops on the way up. And maybe a bear den (video). Once on top, you will start to see some of the damage from the January 2009 ice storm. Through the supreme effort of the volunteers from the Ozark Highlands Trail Association, the first 100 miles or so of the OHT were cleared by March giving us an open trail. Once you cross FR 1003T (OHT-05, N35.697420 W094.007072) you will be in prescribed burn. 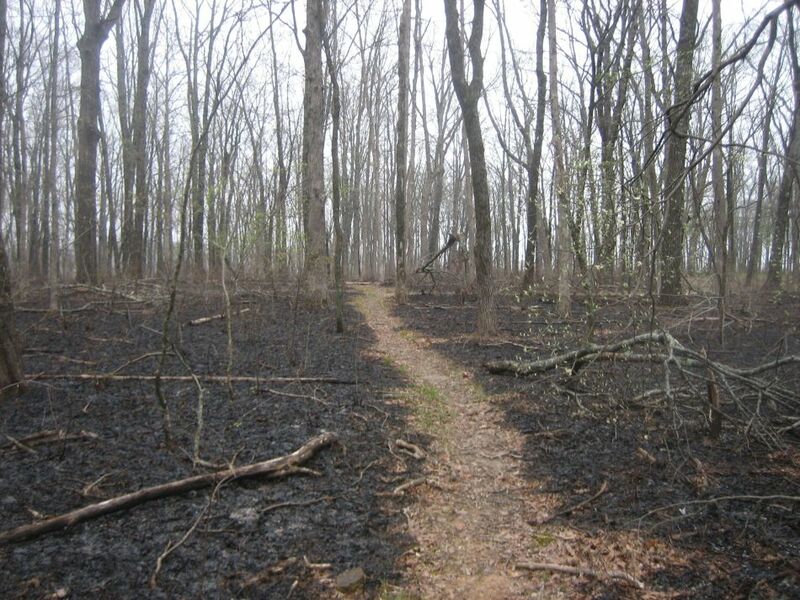 For us it meant the forest floor was black with char and there were occasional smoking piles of embers. 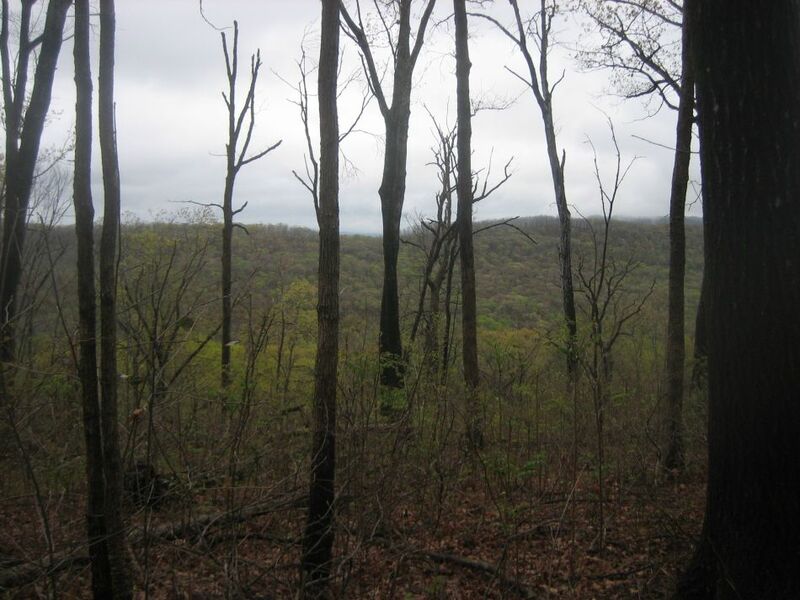 For those of you hiking after summer of 2009, it will mean several years of a more open forest. There is a big drive-in camp site on top of Richardson Mt with easy access from FR 1003. 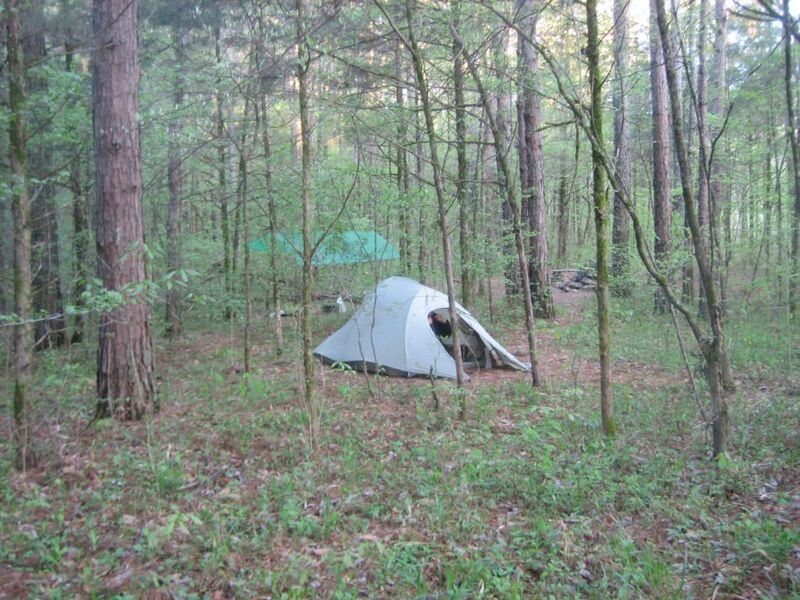 It is probably packed with hunters during deer season, but otherwise it might make a convenient camp if you arrive in the area too late to hit the trail. The trail stays fairly level for about 2 miles as it crosses the flat top of Richardson Mountain. Just before mile 15.0 it drops off the mountain top shelf and begins to contour for about 1.3 miles to Woods Gap (OHT-06, N35.697717 W093.968612). After crossing FR 1003, you will continue your contouring and swing south below White Rock. Just past mile 17.0, you should get some glimpses of White Rock and hear visitors at the overlook. At mile 17.7 is the junction with the trail to Shores Lake. The next several miles on the OHT overlaps with the White Rock-Shores Lake Loop. For us, this was a rainy (video) section. White Rock to Fane Creek (OHT Map 3): After a small climb you will top out on a ridge jutting out to the east from below White Rock Mountain (mile 18.4). A spur trail taking off to the west will lead you to the recreational area at the top of the mountain. 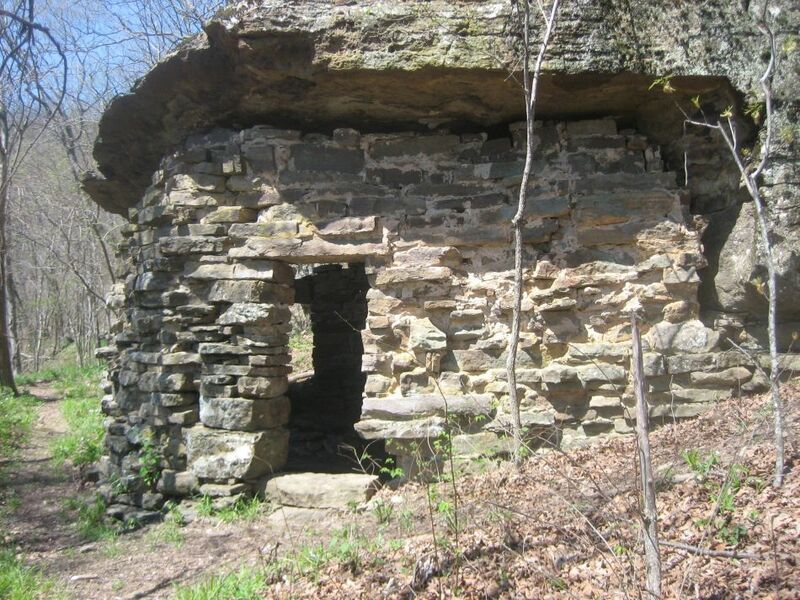 It features stone cabins built in the 30s by the Civilian Conservation Corps, car camping and drinking water. This is one of the few trail heads on the OHT with any kind of services. The OHT heads east and soon begins its 1,100 foot decent to the Salt Fork. It takes place over about 1.8 miles and never gets too steep. We never saw mile marker 19 but found marker 20 near the bottom. At about 20.1, the east spur of the White Rock-Shores Lake Loop comes in from the south. Keep going straight and cross Salt Fork Creek (video) at 20.2 miles (OHT-07, N35.698921 W093.932638). There are good campsites (video) on both sides of creek. As we found after a night of rain, the Salt Fork can get pretty deep (video). We crossed the evening before so no worries. If it looks too dangerous, bushwhack south to FR 1003 and come back north on the old forest road on the east side of the creek. Leaving the Salt Fork and the greater White Rock area, the trail climbs 900 feet over the next 2.1 miles to Potato Knob. In this section we saw a nice open forest that looks like it was part of a prescribed burn within the last couple years. At the top of the climb is OHT-08 (N35.701581 W093.915072) and the Potato Knob trailhead. The trailhead is very basic consisting of a dirt parking lot that is little more than a turnaround. Access to the trail is via the forest road. What goes up, must go down; from Potato Knob, it is back down hill into the Spirit Creek valley. It is a 900 foot descent over 2.3 miles. The first thing you will see at the bottom is a camp site on your left. As you hike upstream along the creek you will pass under two bluffs with little water falls (video) (if it has been wet). 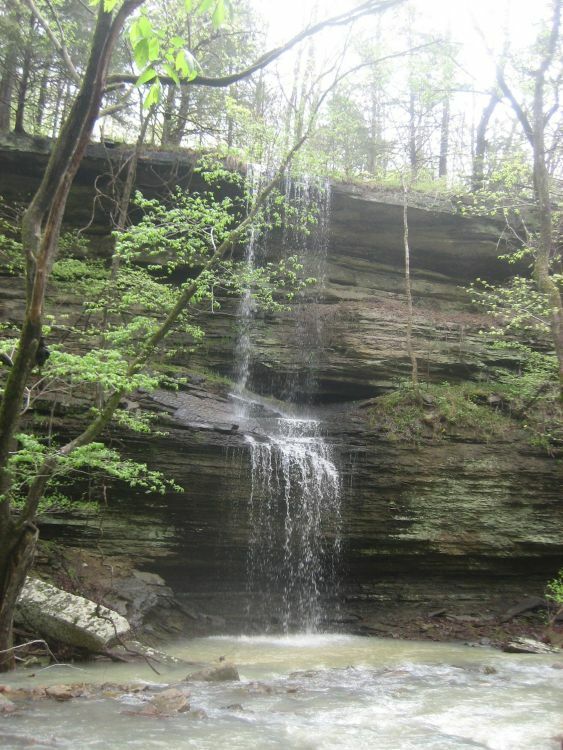 When you get to the creek crossing you will see a spectacular 30 foot waterfall (video) on the east side. (Once again, to could be dry, which is a good reason to go in the spring.) On the west side there is a spur trail back to a very small creek side camp site. If you want stay in the valley for the evening, I think the first camp site is better. However the best site is further up the trail. Cross the creek and follow the trail up hill to the north. When the trail reverses direction and heads south look below you to the north and there is a campsite in the wood. If you were looking at Spirit Creek while hiking to this point, you will have no doubt seen some interesting bluffs and slick rock slides. This is a nice destination, good for exploring the creek. What goes down must go up, at least in the Ozarks. It is a 600 foot climb over 1.2 miles to get to the top of the next ridge and FR 1509. This is OHT-09 (N35.683749 W093.897983) and you are at mile 25.8. 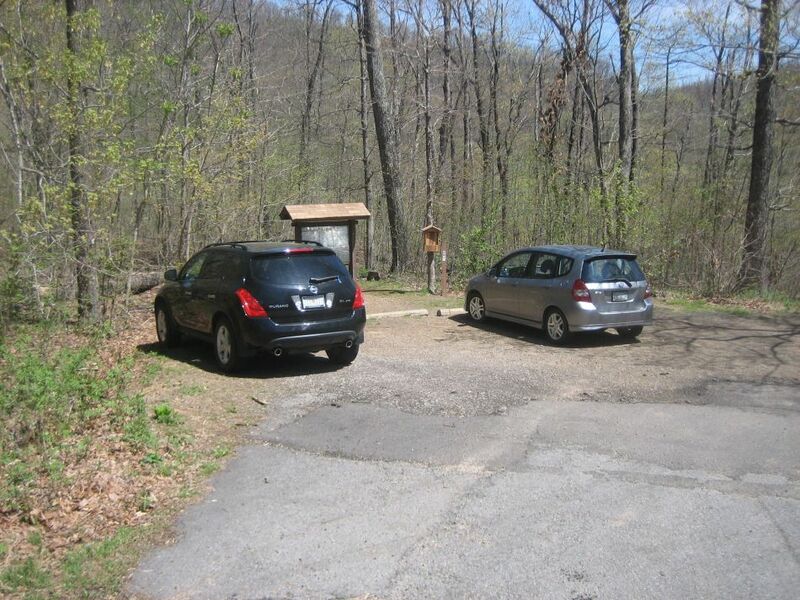 The trailhead is a dirt parking lot and the trail is accessed from the forest road. The next several miles are pretty level. After a short gradual down hill the trail contours along the north slope of Black Mountain. Just before mile 27, the trail drops about 100 into a hollow of upper Fane Creek. After crossing the small creek and a short climb you will see an embankment to your left where the old logging tram trestle used to cross the hollow, for the next two and a half miles you will be on the old railroad bed (video). 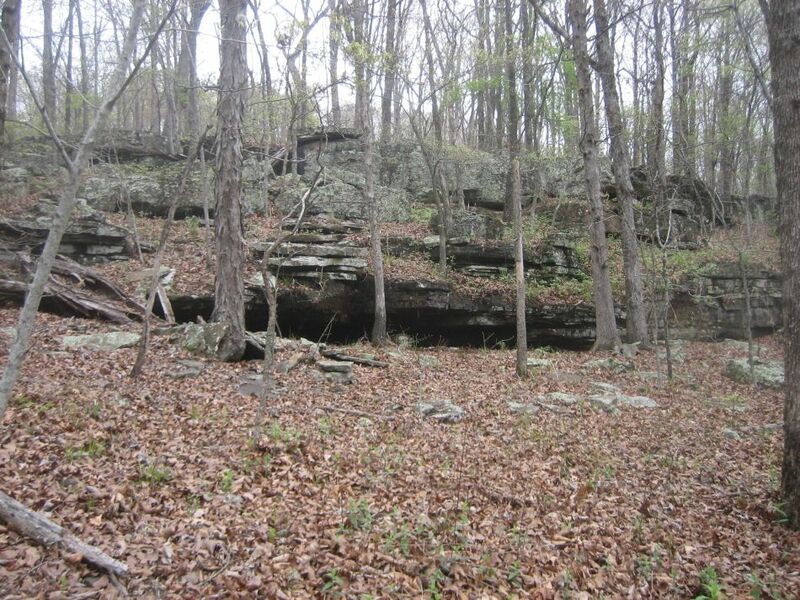 It is very level with some nice rock exposures where the bed was cut through several hills. When it is wet it can also have lots of pooled water making it a pretty wet. Since the grade is slightly down hill, this is an area where you can really cruise. Just before the 30 mile marker, the trail veers downhill to the left and leaves the tram. The tramway continues on its same course, so if you go too far without seeing a white blaze, you may have missed the trail. Your decent to Fane Creek will be a little steeper but still gradual. At mile 31 there is a wildlife pod and a clearing. 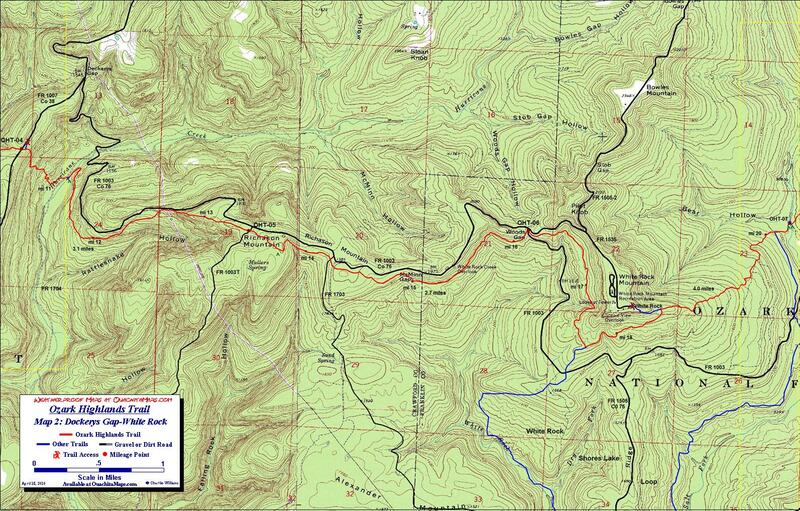 Fane Creek to Cherry Bend (OHT Map 4): Fane Creek is at 31.6 miles. 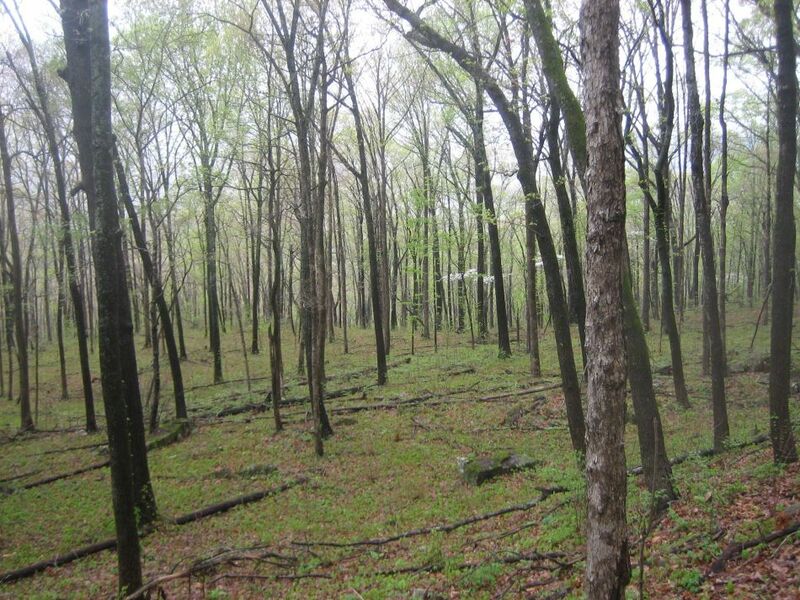 Whereas up to now the trip from Lake Fort Smith has been through an oak-hickory forest, the bottom land around the creek is a pine stand. The crossing at Fane Creek is across a big rock slab. When the water is lower, you can step or jump across the narrow incised channel. When we were there the water was up (video) and covered the entire slab. Another time I came through there was debris about two feet above the ground in the campsite. It was a rare flood, but always pay attention to the rain. The main campsite is just before the crossing. It has grown a monster fire pit so if you find the fire pit the pits, the whole area on this side of the creek is real flat and there are plenty of places for an LNT campsite (video). Just across the creek is a small campsite and FR 1520 (OHT-10, N35.700384 W093.834082). If you turn right (east) on FR-1520, it is about 1.4 miles to Cass and Highway 23 and another 1.6 miles to the Turner Bend store. I have never noticed any stores in Cass so if you need food or other provisions, the Turner Bend store is about the only place anywhere near the trail, and it is limited. The next section is a long uphill, rising 1,400 feet to the top of Whiting Mountain over 4 miles. The highlight is a moss covered rock garden just shy of mile 35, near the top of the northeast-southwest trending ridge. From there it is one more climb to the saddle on the top of Whiting Mountain. There is a road/pipeline right-of-way, so you can’t miss it. The rest of the trip to Cherry Bend is down hill. At about 36.5 miles the trail has been rerouted. While the new footpath was a little steep and slick in a few places, there was a riot of color from all the wild flower. 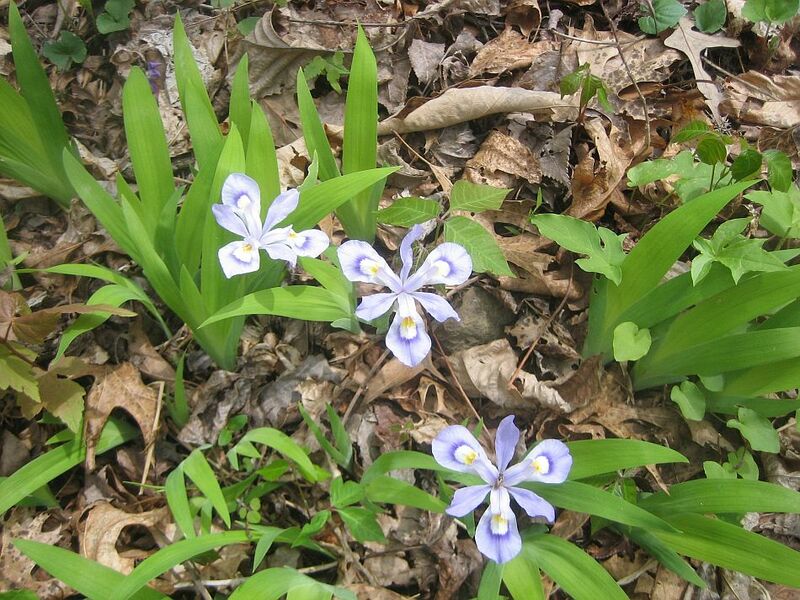 Canada violet, Ernest's spiderwort, large-flowered bellwort and wild blue phlox abounded. Just before getting to Highway 23, there is a spur trail back to the left and up. A few hundreds feet up the spur is the Rock House (video), a stone structure built under a rock overhang. It is very cool! Back track to the spur trail junction and turn left on the OHT. 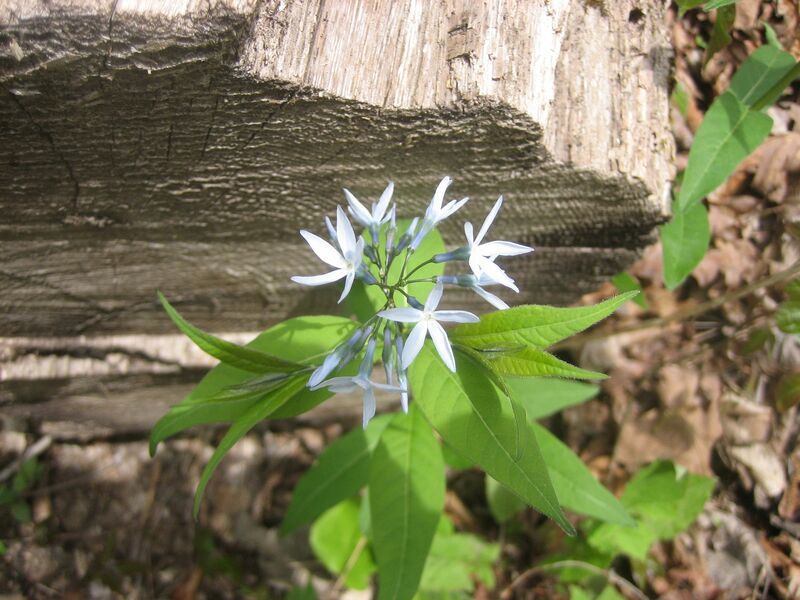 Go about a 0.1 miles and look for the blue blazes of the spur trail to Cherry Bend trailhead. Look both ways and cross Highway 23.The topo maps show this as the Cherry Bend Recreation Area, but now it is only a trailhead parking lot. 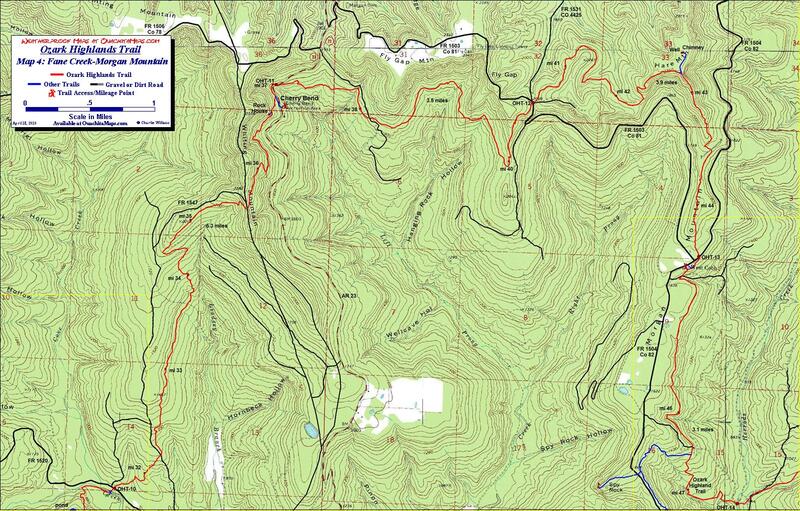 Info: USGS 7.5 minute quadrangle topographic maps: Fern, Bidville, and Cass AR (trail not shown). Ozark-St Francis National Forest, Russellville, AR (479) 964-7200. http://www.fs.fed.us/oonf/ozark/. 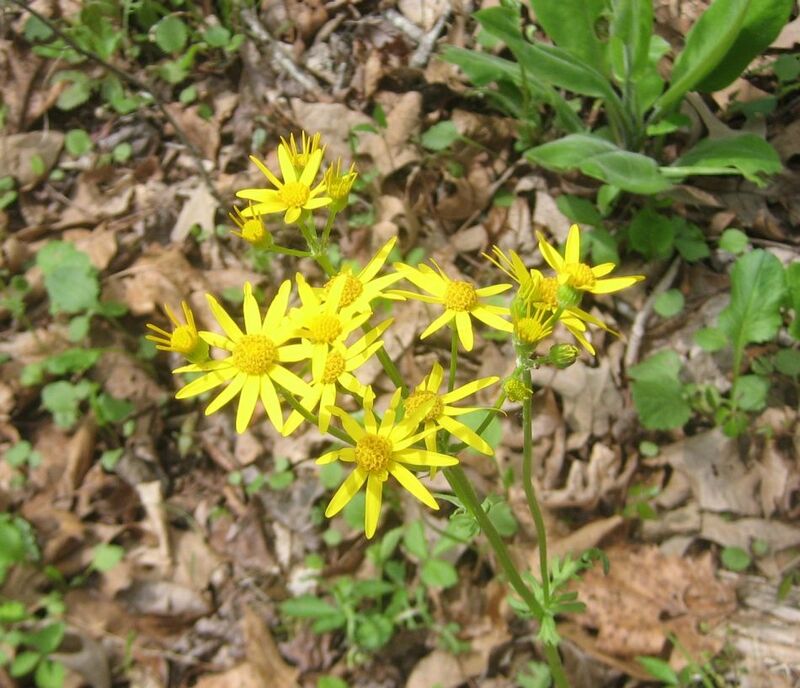 Boston Mountains Ranger District, Ozark, AR, (479) 667-2191. Logistics: We used the Turner Bend Store for a shuttle. They took us in our vehicle from their store south of Cherry Bend on Highway 23 to Fort Smith State Park, kept the car until the morning we were coming out and dropped it off so that it was waiting for us. Cost was $90, but the car was kept secure for all but a few hours.